The announcement of the 13 honorees for the 2015 Caribbean American Movers and Shakers Awards was officially made public on Friday May 15, 2015. The 2015 list of honorees highlights the best of the City of Atlanta, Georgia. The event will be held at the chic urban Caribbean restaurant Negril Village, on Sunday June 14, 2015 at 4pm. Television and Radio Personality Mr. Darian “Big Tigger” Morgan. and our Lifetime Achievement Award Honoree, Anthony Quan, CFO and Strategy- Pacific Group at The Coca-Cola Company. 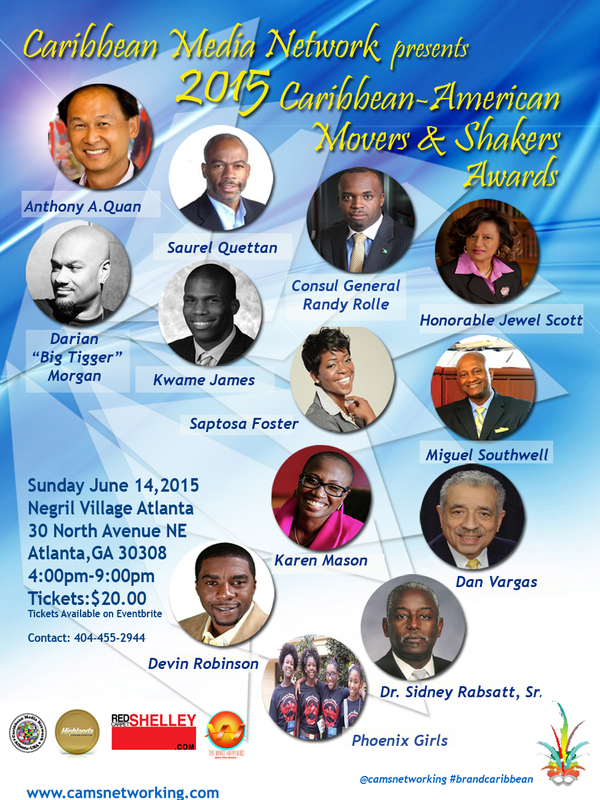 The 2015 Caribbean American Movers and Shakers Awards include a series of award events, in the prime markets of Atlanta, Georgia, New York City and Miami, Florida, throughout the year. The Caribbean Media Network, in conjunction with affiliates, will host this memorable awards celebration on Sunday June 14, 2015, at Atlanta’s new urban chic multicultural hot spot, Negril Village Atlanta. This luxury venue is located in the heart of Midtown Atlanta, which will serve as a tropical oasis for this year’s celebration. The event will start promptly at 4:00p.m. The 2015 Awards event, will be feature Caribbean American entertainment, lifestyle, and culture specialist, Red Carpet Shelley, and a variety of celebrity presenters. The atmosphere will be highlighted by the International DJ’s Highlanda Sound along side some special invited guests. To purchase tickets and more information visit http://camsawards.eventbrite.com or www.camsnetworking.com.